Every business needs to have an online presence these days. Your customers will expect to be able to find your business online. Besides, you are going to have a hard time taking your local marketing campaigns to the next level without a good looking site. We have covered many attractive business themes here in the past. 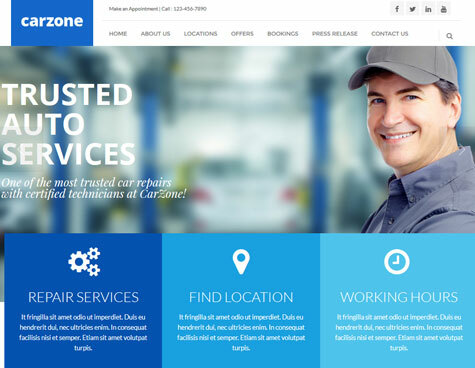 Car Zone happens to be a commercial theme for towing and car repair shops. It has 5 header styles, multiple layouts, and various custom widgets. Car Zone is a responsive theme. It comes integrated with the Slider Revolution plugin. It supports custom subheader height for pages and images for pages and posts. Need a full-width layout for a page? No problem. The theme has a built-in shortcode generator. It lets you maintain a side blog as well. It has custom widgets for Twitter, Flickr, and your contact information. Car Zone comes integrated with Google Fonts. You can customize its colors and background image conveniently. The theme is ready to be localized. It is a commercial theme by an Elite Author.